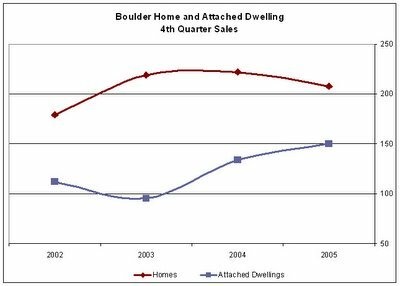 It's still early to tell, but it looks like Boulder's market may have painted a mixed picture for the 4th quarter of 2005. Current results indicate the number of homes sold dropped a little more than 6% compared to the same period a year earlier while Condo/Townhome sales increased nearly 12% (see chart below). 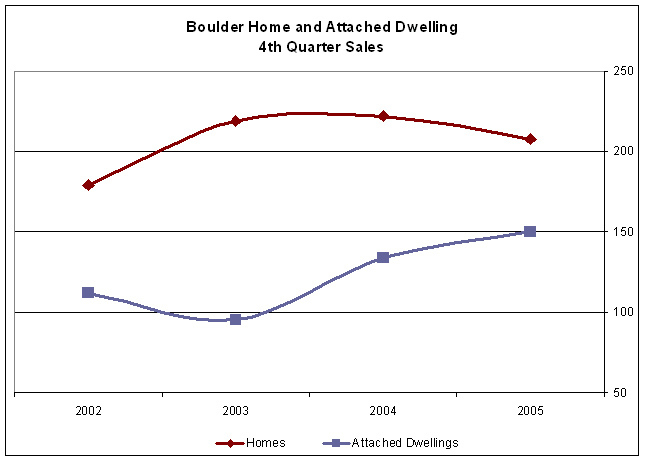 The number of homes sold in the 4th quarter was still 16.2% more than in 2002. Keep in mind these numbers are preliminary and are based on a small sample size (208 homes sold, 150 condo/townhomes). Statistics are dependent on brokers correctly entering data in a timely fashion. With the holidays in between, it's likely a number of them haven't updated their listings. I'll check back on this in a few weeks and update. p.s. click on the cart for a larger image.